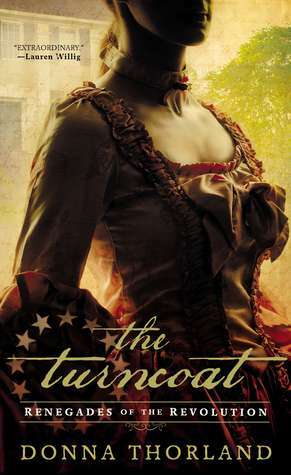 I love historical fiction, and The Turncoat did not disappoint. I will admit that I remembered very little about the Revolutionary War before I read this book. I remember it being one of the more boring fragments of history to learn about, mainly because history books focus more on the economical and political aspects which went way over my head. The Civil War I could wrap my head around, The Revolutionary War, not as much. But man, if I had read The Turncoat in high school I would have been driven to learn as much as I could about it. Thorland does an amazing job of capturing Philadelphia in the late 1700’s. The first few pages were a little overwhelming with a lot of information and I was worried that I wouldn’t be able to keep pieced together who everyone was. Again, I remembered very little from history class so some characters that I should have known right away were still a mystery to me. Thankfully, after those first few pages it all came together for me and I could see them all as individual people working for their own causes. Kate is probably one of my favorite characters of all time. She is feminine, vulnerable, naive to certain aspects while incredibly intelligent regarding others. She isn’t a damsel in distress who needs to be rescued though she is willing to accept rescue if it comes her way. She is strong and dependent and willing to sacrifice everything for what she believes is right. I loved her. And Peter. I would have fallen for Peter if I were Kate. His development throughout the whole book is perfectly paced which makes it believable and real. Normally I get bugged when an author makes months fly by in a few paragraphs, but The Turncoat read more like scenes from a movie and the shifts in time were perfectly natural and even welcome. This book could have easily filled three more, but only the necessary moments were kept in. And, after reading the Readers Guide at the back of the book I learned that this is the beginning of a Trilogy. The second book has to do with Pirates. Who doesn’t love a good pirate? If you love historical fiction, you won’t disappointed. It is probably in my top five favorite historical fiction novels, if not my absolute favorite. Give it a chance. You know you want to. I will read almost ANYTHING related to the Revolutionary war era – I’m going to read this, for sure. Thanks for the review. I like historal novels. This one looks dense but interesting. I’ve always loved historical novels. Thank you for sharing. The Turncoat sounds fabulous. I love historical fiction as well. It’s my favorite genre. I’m having surgery for a degenerative back condition soon. I’d love to be able to get this book before I have all the extra time recuperating. Your review was great. As you can tell, now I want it! This sounds like a really great book. I will have to keep an eye out for it. Thanks for the review! I love historical fiction, but I haven’t read much set in the Civil War period yet. I’ve always loved the idea of reading up on historical fiction and nonfiction, but have never gotten around to it. Perhaps this can start me on my path!